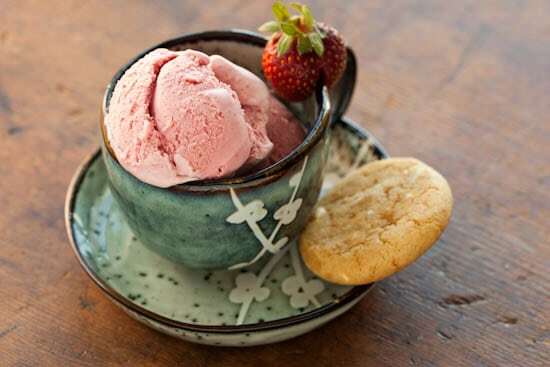 Spring is turning into summer, temperatures are soaring, and the time for strawberry ice cream is now. I’ve been buying beautiful, sweet, local berries at the Farmer’s Market for weeks now and this week is no exception. Last week I ate the strawberries fresh as a snack, as dessert, in salad, and even blended a few into a salad dressing. But this week, with 100 degree heat quickly approaching, I needed something frozen. This ice cream might seem a bit extravagant with the heavy cream, egg yolks, and vanilla bean, but homemade ice cream is meant to be a treat and I like it rich. Perhaps next week I’ll give you a more figure-friendly sorbet recipe, but there’s nothing wrong with splurging on real ice cream from time to time. Enjoy! 1. In a medium bowl, lightly mash strawberries with 1/4 cup sugar and the tablespoon of lemon juice. Toss to combine and set aside. 2. In a saucepan, stir together cream, remaining 3/4 cup of sugar, and salt. With a sharp knife, split the vanilla bean pod in half lengthwise and using the tip of the knife, scrape the seeds into the pot of cream (if using extract instead of vanilla bean, you will stir it in later); add the pod halves to the pot, too. Bring the cream mixture to a simmer over medium heat, then turn the temperature all the way down to low. 3. In a small bowl, whisk the egg yolks until smooth. Slowly add a ladleful of the hot cream mixture to the egg yolks, whisking continuously. Slowly pour the yolk mixture back into the pot of cream and whisk until incorporated. Bring the liquid back to a simmer and cook, stirring, for 5 – 6 minutes until the mixture is thick enough to coat the back of a spoon. Strain the mixture through a sieve into a medium bowl. 4. Puree the strawberry mixture in a blender or food processor until smooth. Stir the strawberry puree into the cream mixture until completely incorporated. If using vanilla extract instead of vanilla bean, stir extract in now. Place a piece of plastic wrap directly on the surface to prevent a skin from forming while cooling. Place bowl in the refrigerator and allow the mixture to cool completely – at least two hours. After it is well chilled, freeze mixture in an ice cream maker according to manufacturer directions. Recipe notes: This recipe works for a 1 1/2 quart or larger ice cream maker. I use the Cuisinart ICE-20 and have been very happy with it. My ice cream was soft-serve consistency after about 25 minutes. I placed it in a plastic container in the refrigerator for another couple hours to firm up. Bumper crop of strawberries this year ... good year to try every strawberry-centric recipe you can think of. I was just thinking of making strawberry ice cream the other day, as I finished off 2 lbs of the best strawberries yet this season. Must get more and make this! I love the picture! I never remember to leave a strawberry out to garnish! Plus I never have cookies, and I need the cute cup! I'll have to try this out! I've been looking for an excuse to drag the ice cream maker out again. The last thing I made was a tea sorbet a couple months ago. It was very rich, and very good! This post inspired me to hit the strawberry patch this morning...I'm now scooping up delicious strawberry ice cream! Love it, thanks for the recipe! I made fresh strawberry ice cream for a Memorial Day picnic and it was sooo good. Yours looks fantastic too! Looks great! Now I know what to do with all those extra strawberries. Thanks for posting. I love your photos!! You still continue to be an inspiration. Linda: I just updated the recipe. The salt is added to the cream with the sugar. Thanks for pointing out the omission! This looks so rich and delicious! Summer really is all about ice cream!! I'm planning on making some sorbet this weekend. Since I have some fresh watermelon, I might try Summertime Delight Watermelon Sorbet. Or if I'm in the mood for strawberry, maybe I'll try that! Thanks for sharing! I wanted to add my comments about this YUMMY recipe. I made this and it made a generous 1 1/2 quarts in my ice cream maker. It turned out a pretty pink and was very good. Took us only a couple of days to eat it all!! Thanks for the wonderful recipe. Thank you Nicole for always having the recipe that I am looking for! I can't wait to try this one out! Pretty section of content. I just stumbled upon your blog and in accession capital to assert that I acquire actually enjoyed account your blog posts. Any way I'll be subscribing to your feeds and even I achievement you access consistently rapidly.